This page is intended to be a warning to you and inform what can happen if you are not carefull, and I don't want any one injured by the information contained at these hydrogen/oxygen pages. For those that have come in late I have been doing some experiments with hydrogen/oxygen generation. It has come to my notice lately and from a personal experience that some of the information supplied on this series may prove to be harmful or fatal to inexperienced users. I have tried to construct a torch as per diagram below and failed,luckily no one was hurt. The torch was basically two tins one placed inside the other. The inner tin had a tight fitting lid with a small nozzle in the lid. Please note this lid was tight but could be easily removed. The outer tin was filled will water and this level was allowed to flow into the inner can. Gas was fed through to both cans via a plastic supply tube position at bottom of can and allowed gas to bubble through the water in inner can and exit through the top nozzle. I let the gas bubble for a few seconds and then placed a lit match next to gas output nozzle, where upon there was a loud explosion and the inner lid was forced off the can and also the inner can was blown open. If I had not had this primitive bubbler I am sure the main supply of 25 liters would have exploded as well. So I issue this warning to not in any way or any circumstance allow a naked flame near your gas supply or the outlet as a flame flashback can backtrack to you main gas storage unit and then with the possibility of exploding violently and causing injury or worse to yourself and others. 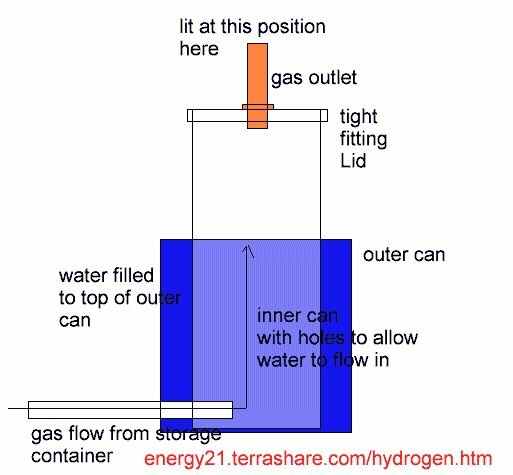 I have had one suggestion from another source to build a small water gas bubbler between the main gas storage supply and the gas outlet to allow minimum gas exposed to flame. This bubbler must be strong enough to enable a back flash explosion and be stopped by the water and the strong casing,it seems explosions are likely to happen often with danger to yourself ,others and the property around you if this safety measure is not included. The bubbler device ,it seems is a small strong stainless steel cylinder ,enclosed at both ends, filled with almost to the top with water and then gas is allowed to enter at the bottom of cylinder bubble through the water to an outlet on the top of the cylinder. There appears there should be a gas flow with some back pressure unfortunately my design at the moment will not allow this ,so in no way should you try to ignite the gas coming out from design at these pages. That story on your site, about the bubbler and setting fire to the gas coming out of it, is sort of funny.. Sort of not so funny too..
What you're up against here is the rate of flame propagation- the gas mixture has to be coming from the orifice faster than the fire travels through it. I'm assuming that your gas is the oxy-hydrogen mix as it comes off the electrolysis tank, and that's pretty serious stuff. I'd not try pressurizing it even a little bit, and I'd even consider storing it (if you have to store it) in some sort of soft container so as to not allow it to be contained if it happens to somehow be set off. Or maybe have a large weak spot in the storage tank that can easily blow out in a safe direction in case of a flashback into the fuel storage. Pressure is what is involved in an explosion, and the pressure is produced by the heat of the reaction- If you contain this pressure the speed of the reaction (rate of flame propagation) increases. Which produces a greater pressure, which leads to a more impressive explosion. If you allow the pressure to escape the container you will reduce the damage involved in a flashback. Outside storage, with the pressure relief area of the tank directed up would be a good start. If you direct the pressure of an inadvertant explosion in any other direction you have the potential for an unguided missile..
Keep in mind, also, that the position of the pipe taking the gas from the container influences pressures involved in an accidental explosion- If you have a soft top on your container, and are taking the gas out of the top then when it goes off the top comes off immediately and the pressure is lower. If you're taking the gas from the bottom of the container and it goes off, it takes time for the pressure to reach the top (not much, admittedly, as the pressure wave will travel at the speed of sound) and in that time delay you'll find much greater pressures being reached before the top can come off- which will knock windows out of houses much farther away:-) > >DC electrolysis allows for the gasses to be seperated, in which case you can >safely compress them (with the proper equipment) as much as you like, which >leads to high volume storage, etc. If you're using AC, you might look into >something like an osmosis seperation system- don't know if anyone is into it >or not, it's just something that occured to me while writing.. THIS INFORMATION IS SUPPLIED FOR EDUCATION PURPOSES ONLY AND NO RESPONSIBLY WILL ACCEPTED BY THIS AUTHOR FOR ITS MISUSE. Copyright Geoff Egel 2000 Please Share the contents and mention this web site to your contacts and friends.